Tackle: You want to bring high gear ratio reel to help you set the hook on the fast mangrove snapper. For the rod, you want a medium strength rod with a sensitive tip to help feel the bite. Forty pound test is best for the snapper leaders with 3-5ot double snelled hooks. If you don’t know how to double snell the mates can teach you on the way out. 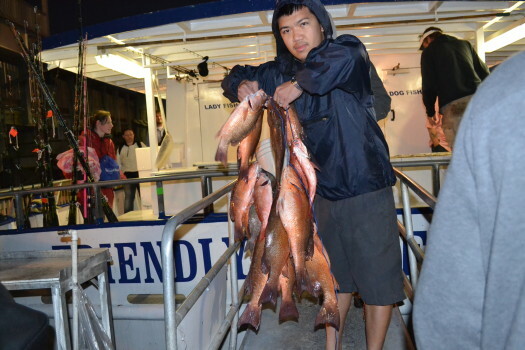 The 12 hour night trip is a snapper trip. We don’t go quite as far on this trip, only about 25-30 miles out. This means you get more fishing time,run time is 1 and a half to 2 and a half hour ride out and back, which leaves you with 7-9 hours fishing time. Since we’re not quite as far, were not in as quite as deep water! This trip doesn’t require as much experience. However, to do well and catch a lot of mangrove snapper you have to be pretty good since mangrove snapper are one of the hardest to catch. They bite quickly and aggressively and you only have a few seconds to set the hook. We recommend a double snell hook rig for them and we would be happy to show you how to tie this. 1 and a half to 2 and a half hour ride out and back 7-9 hours fishing time. Distance: Cruising out 15 to 35 from shore. Depth: The average depth is over 60-120 feet of water. 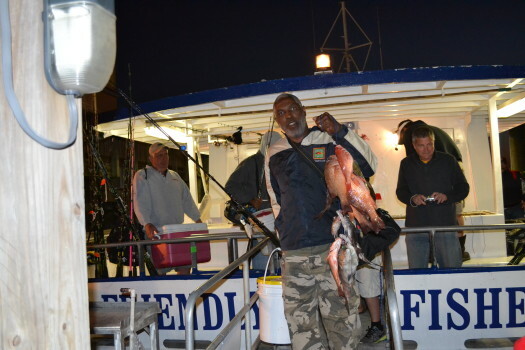 Catch: On this special trip we target primarily mangrove snapper, however, during gag season you do have a slight chance at some of them. 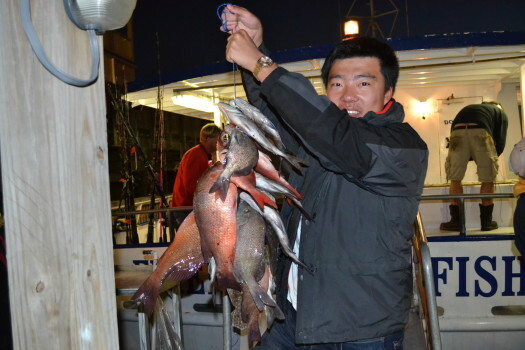 We will also see plenty of vermillion, porgies, yellowtail, and possibly some seabass. 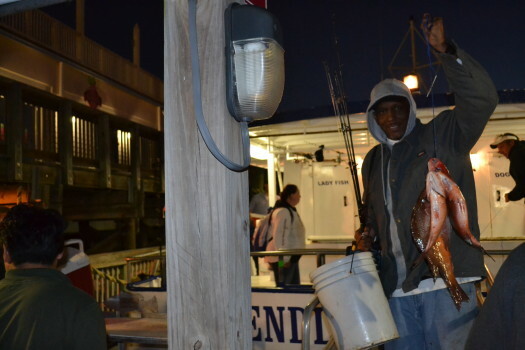 Red grouper and hogfish do not bite well at night however so that would be a rarity. 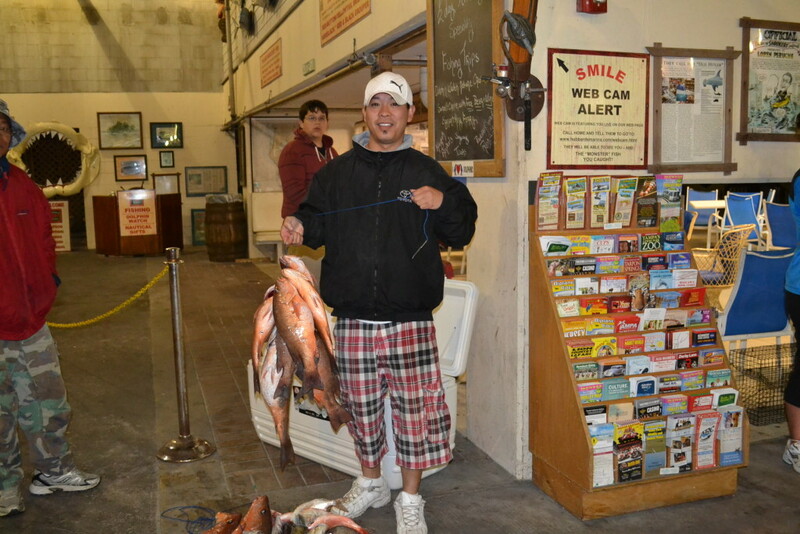 Keep in mind mangrove snapper are the quickest biting super smart snapper that take lots of experience to dial in on. We would strongly recommend you check out the [fishing tips](https://hubbardsmarina.com/fishing-tips/) to see what Capt. 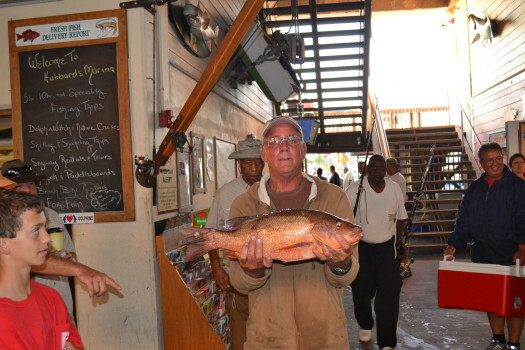 Dylan Hubbard recommends for mangrove snapper. 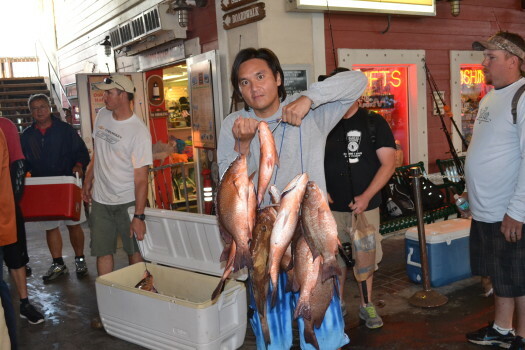 Also, be sure to watch the [How to tie a double snell](https://www.youtube.com/watch?v=FiaOiD1Bcvs) video because that rig will help you catch TONS more mangrove snapper. Bait: Cut squid and threadfins are provided on board at no extra charge. Live shrimp and live pinfish do work well but it’s simply and extra option. You don’t NEED it, but it does work well some nights better than others. Live pinfish work well for the grouper and big mangroves. Live shrimp works VERY well for the mangroves and other snapper species. We will cover it more in depth in your pre-boarding seminar before the trip and you can purchase it prior to the departure of your trip after the seminar before boarding if you so choose. Communal live well available on board. Includes: 2 Sandwiches (breakfast & lunch), 2 bags of chips, 2 candy or granola bars, 4 sodas, unlimited water with $2.25 Happy Hour Beer prices with the package. Please note – children must be age 12 or over to take this trip. FAQs– Things to Know Before You Go ! Tackle: For snapper species, we would recommend a high speed or two speed reel with 40-50lb test line, 4oz sinker and 4/0 to 5/0 hook. In addition to this, you could bring a 5000 series spinning reel for when the bite slows down or you want to use shrimp. We would use 20lb main line and 30-40lb leader with the spinning combo. for lead sizes on the spinners 3/4-1 ounce lead work well with 4/0 hooks. 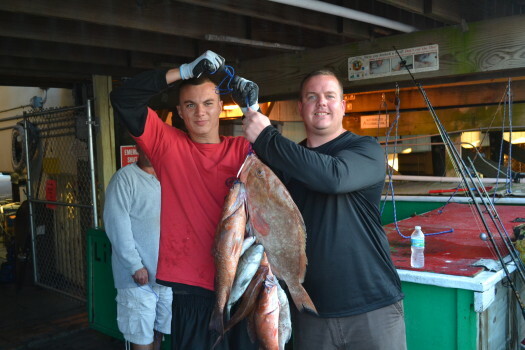 For the grouper we would recommend 60 to 80lb test line, 6oz sinker and 7/0 hook.